Andy and I left the southern Willamette Valley early in the morning and headed north to Meadows hopeful to get in some powder riding. The weather was pretty nice when we pulled in the parking lot, and the mountain had received a pretty good dump of snow the night before. As usual, there were hoards of people running around, but we found pretty good solitude off of the Hood River Express Chair on Private Reserve. 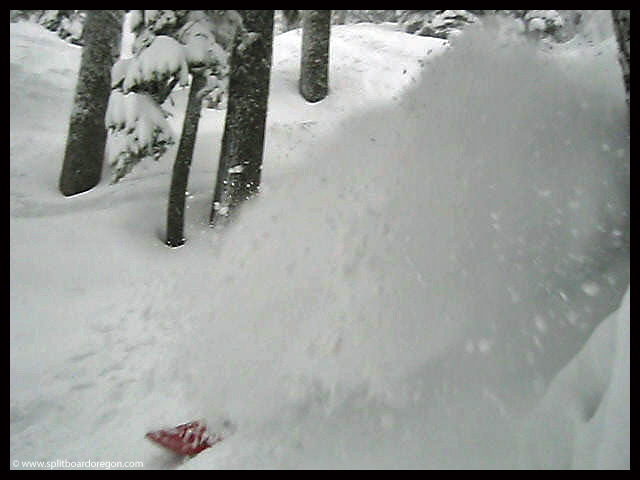 We made laps in the trees around Elk and Yoda bowls for most of the day, and found plenty of face shots and deep powder. We took some video, and I pulled this still from one of the videos. Gotta love late March in the PNW!